Facing the Bronx Bombers, the 1943 Cardinals got buzzed by the real deal. During Game 1 of the 1943 World Series between the Cardinals and Yankees at Yankee Stadium, a B-17 Flying Fortress bomber startled players and spectators by passing so low across the ballpark it nearly scraped the top of the flagpoles. Three months later, the pilot, Lt. Jack W. Watson of the U.S. Army Air Force, made a brave landing of a burning B-17 at an airfield in England. On Oct. 5, 1943, the Yankees were on their way to a 4-2 victory over the Cardinals when, in the eighth inning, four B-17s suddenly rumbled above the stadium packed with 68,676 fans. Imagine the sight: The B-17 was a massive Flying Fortress that “bristled with armament,” according to the Boeing Web site. It was 74 feet long with a span of 103 feet. Powered by four engines, the B-17 carried about a dozen machine guns and was capable of holding up to 9,000 pounds of bombs. Watson and his crew, along with three other crews, had left a training session in Florida and were flying their bombers to Maine for a stopover before heading to England. 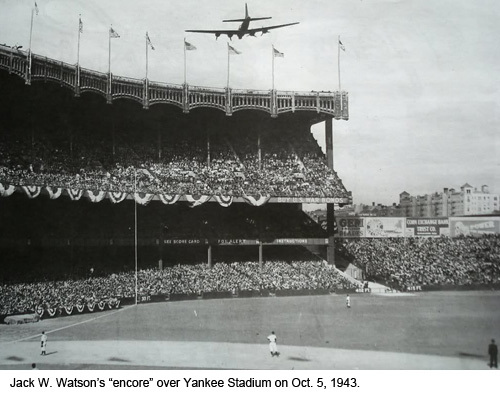 When they reached the New York area and realized the World Series game was still going on that Tuesday afternoon, the crews, led by Watson, decided to buzz Yankee Stadium as a stunt, according to a Web site dedicated to the 303rd bomb group. All four planes flew in formation over the ballpark, entering above home plate and roaring toward the outfield. Many initially thought it was an authorized show of military might and American pride by the Army Air Force. New York Mayor Fiorello La Guardia, who was at the game, told the Associated Press the Flying Fortress “flew right down over the stands” three times. “If anything had happened, a thousand people would have been killed,” an angry La Guardia said. The mayor demanded the Army Air Force investigate. “That pilot should be properly disciplined, endangering the lives of the citizenry of New York in that manner,” La Guardia said to The Sporting News. Upon arriving in Maine, the four pilots were reprimanded and fined $75 apiece for the stunt. But, because the military needed pilots for combat, none were grounded, according to the 303rd bomb group Web site. A couple of days later, Watson and his crew flew to England to begin bombing missions against the Nazis in Europe. Described by United Press as a “freckled-face kid pilot,” Watson, of Indianapolis, was 21 years old. On Jan. 11, 1944, Watson and his crew, in a Flying Fortress dubbed “Meat Hound,” were part of a massive American-led air bombardment of central Germany. Watson and his crew were assigned to bomb a target in Oschersleben. Just before he reached his target, the No. 3 engine failed on the B-17, Watson told the Associated Press. “But I stayed in formation,” he said. Flying on three engines, Watson and his crew dropped the bombs, turned and started to head back to their base in England. The Nazis, though, unleashed relentless waves of fighter planes to attack the bombers. Watson and his crew were over Holland when they encountered several fighter planes. Shortly after the tail gunner on “Meat Hound” had shot down a Nazi fighter, the B-17 was hit and the No. 2 engine went out, Watson told the Associated Press. “I feathered it then and the fire soon appeared to go out. But a little later the left waist gunner reported smoke and flames pouring out of that engine again. Uncertain whether the plane could remain airborne, Watson instructed his crew of nine to parachute out near Isselmeer, Holland. Alone in the B-17, Watson intended to bail out, too. “I set the plane’s automatic control, put on my ‘chute and started to crawl out the hatch,” Watson told United Press. “I looked down and all I could see was water. I was scared to death. I didn’t want to go into the Channel. I decided I would rather blow up with the Fortress than drown in the Channel. 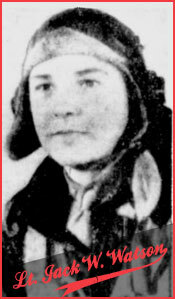 Watson pushed the bomber into thickening clouds and the Nazi fighter planes turned rather than follow him. “Meat Hound” kept flying, though flames were shooting from at least one of the two working engines on the battered bomber. “I wonder whether Mayor La Guardia will forgive me,” Watson said in a radio interview, according to The Sporting News. Watson completed his 35-mission combat tour in June 1944 and was promoted to captain in December 1944.
on November 22, 2013 at 8:11 am | Reply UCB Awards Ballot « The view from here.